When I was a child, I was dragged around my home country of Australia on a family holiday. After days stuck in a back seat fighting with my sister we reached Cairns, and spent a day on the Great Barrier Reef, one of Australia’s premier tourist attractions and a biodiversity hotspot, home to a myriad of corals, fish and other marine life. It was incredible. But nowadays, tourists are flocking to the reef to say goodbye. Extreme weather events in 2016 and 2017 left a massive portion of the reef (whose lagoon is the size of Italy) completely bleached, with coral dying at unprecedented rates. Professor Sean Connolly has been working on the reef since arriving in Australia in 2000. An expert on biodiversity and its drivers, Sean is one of many scientists who society is looking to at the moment to answer a very dire question – what is going to happen to the Great Barrier Reef? Kate Layton-Matthews and I sat down with Sean to talk about the reef’s present state, and how politics can affect our conservation efforts. Sam Perrin (SP): You work with the Great Barrier Reef. What has been the impact of climate change in the reef so far? Sean Connolly, Professor, James Cook University (SC): Well a coral is a combination of an animal – a cnidarian – and a bunch of plants living inside the cnidarian. When the temperature hits more than one degree above the typical summer maximum, that relationship starts to break down, and the animal host expels the algal symbiont. 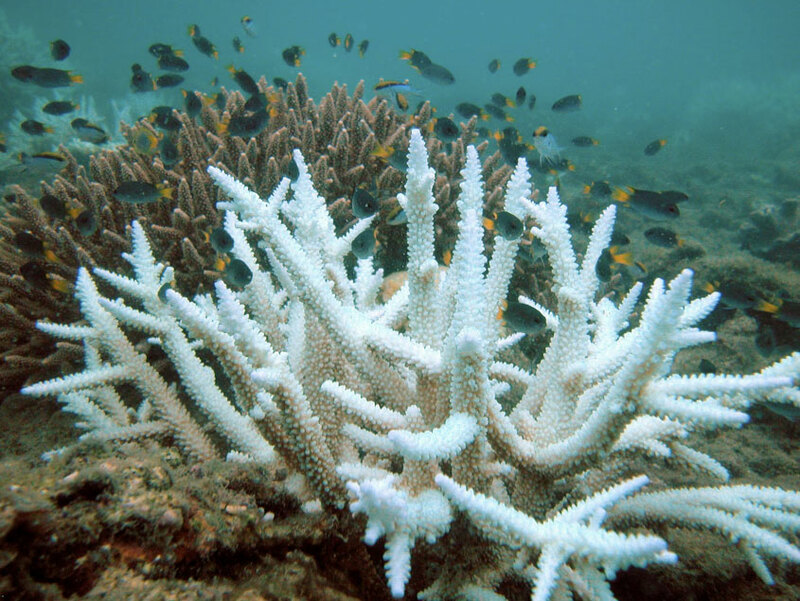 That’s how bleaching occurs, the coral loses everything that gives it pigmentation which is why it turns white. And because that symbiosis is what provides the corals with most of their carbon, they’re deprived of their carbon source, so they slowly starve. Once the temperature drops back down, there’s usually some re-uptake of algae from the environment and repopulation of the host from remnant symbiont populations inside the coral. But if a period of bleaching lasts for a long enough time, you start to get significant mortality. That’s what happened in 2016 globally, and in 2017 it happened again on the Great Barrier Reef. Historically there’s no real evidence of mass bleaching before the early 1980s. There are some reports in historical writings of bleached corals, but it was very localised. Regional scale bleaching wasn’t really documented until the early 80s, and it tended to be associated with extreme events. But you can get mass bleaching in ordinary years now. What happened in 2016 was a level of thermal stress that hadn’t happened before. About a third of the reefs in 2016 were hotter than the hottest part of the reef was in 1998, which was the most severe previous bleaching event. We had some places where 80% of the coral cover died in the northern sections of the reef, where the heat was most severe. Species that you’d normally think of as being stress tolerant, some of those were 100 years old, and just bleached white and died. The other thing that happened in 2016 was that some of the corals died from the heat stress. They didn’t starve, they literally died directly from the physiological heat stress. Then in 2017 we had an event that was quite similar in severity, but the heat distribution was different. So 2016, there was a cyclone that was sitting in the coral sea, and that protected the southern half of the reef from bleaching. In 2017, the hot water was in the central third. 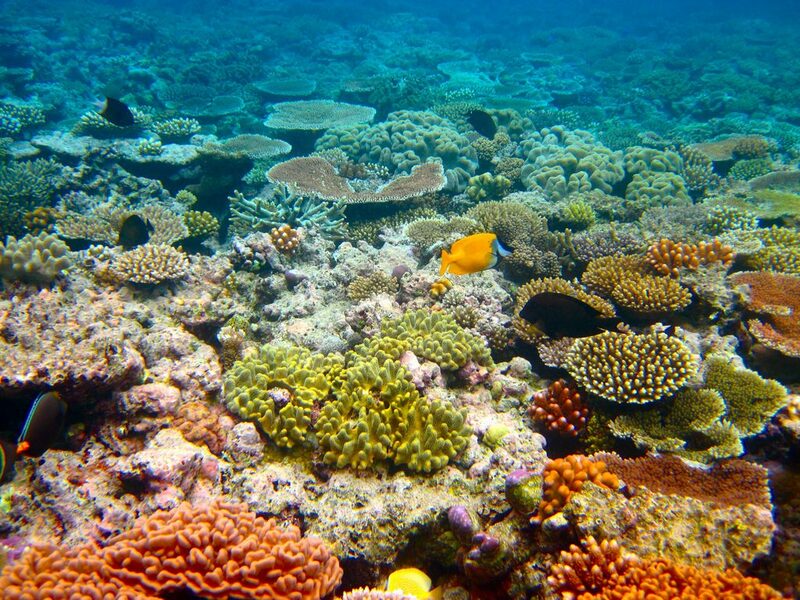 Overall, about half of the shallow-water coral cover in the Great Barrier Reef lagoon – an area about the size of Italy – was lost in those 2 years. KLM: Corals have a thermal tolerance zone. Is there any evidence that these zones are adjusting as temperatures warm? SC: It is true that if you have corals of the same species in environments where there are big diurnal or seasonal fluctuations in temperature, that can influence their tolerance to stress. So corals that grow in microhabitats where the water gets really hot regularly will tend to be more resistant to thermal stress. If you look at populations in the Persian Gulf and the Great Barrier Reef, their bleaching thresholds are different, because the long-term average temperature is a lot hotter in the Persian Gulf. Temperature stress still applies, but it’s imposed on a different long term average. But even with the suggestions that there’s some potential for local adaptation and developmental plasticity, the fact that the frequency and intensity of bleaching is increasing suggests that the rate of adaptation is slower than the current pace of change. SP: What sort of interactions do you have with local government/policy makers as you part of work? SC: When I first got to Australia in the early 2000s, I was involved in a lot of work concerning the potential benefits of protected marine areas and how much area needs to be protected and all that stuff. The Great Barrier Reef Marine Park Authority (GBRMPA), which is the organisation that was responsible for the rezoning of the reef, was extremely responsive to our work. The same thing happened in 2006, I was involved in a population viability analysis of reef sharks. There was a relatively quick policy response, in that when the east coast inshore fin-fish fishery was redesigned and new rules were put in place, they actually imposed some pretty draconian limits on catches of reef sharks, in response (presumably) to our work. I think there are three reasons for that. One is that the GBRMPA is a statutory authority, and so they’re able to make decisions a little bit more freely of ministerial interference. The second is that a lot of people working at the GBRMPA were trained as marine biologists at James Cook University (JCU), and so they have a relatively high level of scientific training and a genuine interest in trying to incorporate research findings in their decisions. The third is that the GBRMPA is based in Townsville which is also where JCU is. So you see these people at the same social events. The fact that there are social relationships between people who work in those organisations helps. It reduces levels of suspicion that you might get in a larger country where there are layers of bureaucracy in between people developing management policy and people doing science. As far as climate change goes, I don’t think that we’ve had much policy impact, at least not yet. The main thing that’s happened since we started publishing this work about the most recent mass bleaching events was that the government announced that it would give 450 million dollars to a private foundation for reef restoration. The problem here is that the effectiveness reef restoration and assisted evolution is controversial. There are differences of opinion among scientists about how effective these things can be, but one thing everyone seems to agree on is that they definitely won’t work if you don’t stabilise the climate. And there’s been essentially backwards movement on climate stabilisation policy in Australia. At the same time, there’s been a lot of international media attention on the mass bleaching. What’s happening to reefs has now gotten people’s attention. And so in that sense, that’s not a direct policy thing, but generating public awareness about what’s going on is one way you start to establish constituencies for policy change. SP: Do we need to change the way we talk to the governments about this? SC: I don’t think it has to do with how effectively scientists are communicating, because what we know about the effects of climate change in ecological systems is international scientific work. Australian scientists are not the only people that Australian policy makers are listening to. I think if you have a look at what countries have relied heavily on resource extraction, those are the countries that have struggled the most to get bipartisan support for climate change policy response. So Australia, the US, and Canada. It seems to be more related to the culture of the main conservative or centre-right political party. You have some countries where centre-right parties don’t consider issues like climate change to be ideological. But you have some countries where they do, where the centre right party has a wing that believes that sees opposing climate change action as a matterof partisan tribal identity. Those are the countries where it’s difficult to get policy change. The next question becomes, is the public aware of the immediacy of the problem? In the last couple of years we were able to measure the effect of bleaching at a regional scale. The Great Barrier Reef lagoon is roughly the same size as Italy. We had a relatively well-funded research centre, so we launched this huge response, we put 100 people in the water measuring the effects of bleaching. There were aerial surveys up and down the reef. We were able to produce video and maps showing the extent of reef mortality, and that’s not something that’s really been done on that scale before. The media likes visuals, because visuals communicate information to the public particularly effectively. I think the reason why this has gotten so much more attention is because we were able to visually depict the magnitude and the scale of the change that was taking place. KLM: So you can’t just focus on science, you need to get the media’s attention to generate policy change? SC: If the public isn’t clamouring for policy change, and there are particular groups that are particularly influential that are strongly opposed to policy change, well then all of the pressure that politicians experience is going to be to drag their feet on action. In a democratic country, the public needs to know what’s happening, if you want policy makers to respond to their values. SP: A problem we have with conservation is that many people in the generation growing up now (and in every generation) don’t realise how species rich the world used to be, because they’re used to the world we have now. Is this a problem for reefs, even though huge changes are happening now? SC: I think that phenomenon of shifting baselines is real for reef systems. There are all these islands in the Caribbean that have the name Tortugas, because during the age of exploration you would have ships that would navigate, they knew they’d be getting close to land because the boat would be hitting the shells of turtles, there were so many in the water. Similarly in Australia there are historical reports of people sitting in bays as a herd of dugong go by that would take half an hour. Our idea of a pristine reef is probably nothing like it would be if there had been scuba diving in the 1700s. Similarly there’s evidence to suggest that inshore reefs, prior to European land clearing in the Great Barrier Reef, had a lot more of what we would think of as offshore clear water species. In some sections of the denialist media you will get people who say “oh bleaching, it’s just what happens in the summer, corals bleach”. Because that happens now in some parts of the world, you get a bleaching season. And that’s an attempt to normalise extreme phenomena, so it’s a conscious attempt to shift people’s baseline to reflect what’s actually happening. They key difference is that we now have good quality video footage of reefs from before this kind of phenomenon. You can watch Blue Planet and you can actually see reefs that haven’t been decimated by a very recent mass bleaching event. And that will help to reduce the extent of that shifting baseline phenomenon. KLM: There are plenty of reef restoration programs around, including the use of man-made compounds to regrow areas. Do these give you any hope that reef ecosystems can recover? SC: In reef restoration, it’s very common to use artificial structures as a way of trying to enhance either survival or growth of coral. Yes, you can enhance coral cover by making use of artificial structures. But those types of interventions, you’re talking about tens to hundreds of thousands of dollars a hectare, and often the longer term survival of these fragments is quite low. So the scale of the interventions is at least presently nowhere near the scale of the problem. It’s like planting a botanical garden when you used to have an Amazonian rainforest. You’re talking about interventions that even at that very local scale might have costs that exceed the economic benefits of being able to bring tourists there. There’s no evidence of spillover effects, where you invest a lot of energy in restoring some small areas, and those areas provide enhanced recovery in nearby areas. At this stage, and if the environments are changing, you’re looking at having to continually intervene, and each successive intervention is going to become less and less effective as the environment becomes more extreme. If you have a friend who has been in a horrific accident, and they’re lying on the operating table in a emergency room, and they’ve had a leg severed, you don’t stand around arguing about what kind of prosthesis to order while the patient is bleeding to death. You stabilise the patient first, then –provided you were able to successfully stabilise the patient– you start deciding what kinds of interventions might help the person adapt to their changed circumstances. The same principle applies here, the first thing you need to do is stabilise the climate.